But Is This World Getting Saved? 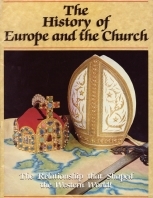 The historic relationship between Europe and the Church is a relationship that has shaped the history of the Western World. Europe today stands at a momentous crossroads. Events taking shape there will radically change the face of the Continent — and the world. To properly understand today's news and the events that lie ahead, a grasp of the sweep of European history is essential. Only within an historical context can the events of our time be fully appreciated. This narrative series is written in the historic present to give the reader a sense of being on the scene as momentous events unfold on the stage of history. ROME, A.D. 64 — The capital of the world is in flames! For six days and nights the great fire races out of control through the most populous districts of the imperial city. In its fury, the blaze reduces half the metropolis to ashes. Many of the architectural glories of ancient Rome are devoured in the flames. Thousands of terror-stricken Romans are made homeless, all their wordily possessions are lost. Some Romans suspect the truth. They believe that Nero — inhuman, maniacal, insane — has personally triggered the conflagration. Fancying himself a great builder, he desires to erase the old Rome that he might have the glory of founding a new and grander city — Nero's Rome! A rumor begins to circulate that the fire was contrived by the emperor himself. Nero fears for his safety. He must find someone to bear the blame — and quickly. To divert suspicion away from himself, Nero lays the guilt at the door of the new religious group — the Christians of Rome. It is the logical choice. Christians are already despised and distrusted by many. They spurn the worship of the old Roman gods and "treasonably" refuse to give divine honors to the emperor. Their preaching of a new King sounds like revolution They have no influence, no power — the perfect scrape goats. Nero orders their punishment. The bloodbath begins. The emperor inflicts on the falsely accused Christians horrible tortures and executions. Some are nailed to crosses; others are covered with animal skins and torn apart by wild dogs in the Circus Maximus; still others are nailed to stakes and set ablaze as illumination for Nero's garden parties. The world, he had told them, would not be an easy place for Christians. Paul, himself, had endured much suffering and persecution during the course of his long ministry. For more than two decades he had persevered in preaching the gospel of the coming kingdom of God through many of the provinces of the Roman Empire. Now, at last, his sufferings are nearing an end. Nero sends his servants to bring Paul word of his impending death. Shortly afterward, soldiers arrive and lead him out of the city to the place of execution. Paul prays, then give his neck to the sword. He is buried on the Ostian Way. The year is A.D. 68; it is early summer. Most of the remaining elders and members of the congregation at Rome are also martyred in the Neronian persecution. Unfortunately, the headquarters church in Jerusalem — towards which Christians look for truth and for leadership — is in no position to render effective assistance to the persecuted Christians of Rome. It, too, is caught in the midst of upheaval, stemming from the Jewish wars with Rome. In A.D. 66, the oppressed Jews of Palestine erupt into general revolt — defying the military might of the Roman Empire! Heeding Jesus' warning (Luke 21:20-21) the Christians of Judea flee to the hills. It is now A.D. 70. Titus conquers Jerusalem. He burns the Temple to the ground and tears down its foundations. The city is laid waste. Some 600,000 Jews are slaughtered and multiple thousands of others are sold into slavery. Though many are suffering — uprooted from homes, imprisoned, tortured, bereaved of family and friends — the prevailing spirit among Christians is one of hope and anticipation. Christians are sustained by the knowledge that Jesus and the prophets of old had foretold these tumultuous events — and their glorious outcome. Everywhere Jesus went, he focused on this major theme — the good news of the coming of the kingdom of God. The twelve disciples were sent out to preach the same message (Luke 9:1-2). The apostle Paul also preached the kingdom of God. (Acts 19:8; 20:25; 28:23, 31). Christians — in that first century — are in no doubt as to what that kingdom is. It is a literal kingdom — a real government, with a King, and laws and subjects — destined to rule over the earth. It is the government of God, supplanting the government of man! Christians rehearse and discuss among themselves the many prophecies about this coming government. By now, they know the passage by heart. The prophet Daniel, for example, had written of a successions of world-ruling governments through the ages (Daniel 2) — four universal world-empires: Babylon, Medo-Persia, Greece, and Rome. Daniel declared that after the demise of these earthly kingdoms, "the God of heaven [shall] set up a kingdom, which shall never be destroyed....but it shall break in pieces and consume all these kingdoms, and it shall stand for ever" (Dan. 2:44). Soon the swords and spears spilling blood across the vast territories of the Empire would be beaten into plowshares and pruning hooks, as Isaiah had prophesied (Isa. 2:4). Jesus would return and "the government shall be upon his shoulders" (Isa. 9:6). For more than four millennia the righteous ancients had looked for the triumph of this kingdom. Now, with Jerusalem the focus of world events in A.D. 66-70, surely, it is about to arrive! During the days of Jesus' earthly ministry, some had thought he would establish the kingdom of God then and there. Because, they thought that the kingdom of God should immediately appear. Jesus had told his disciples the parable of the nobleman who went on a journey into a far country "to receive for himself a kingdom, and to return" (Luke 19:11-12). As Jesus later told Pilate, he was born to be king. But, his kingdom was not of this world (age) (John 18:36). He would return at a later time to establish his kingdom and sward his servants. His disciples no more understood that than did Pilate. After his crucifixion and resurrection, Jesus' disciples again asked him, "Lord, wilt thou at this time restore again the kingdom to Israel?" (Acts 1:6) Jesus told them that it was not for them to know the times or the seasons (verse 7). They found that hard to comprehend. But Jesus, nevertheless, commissioned them to "be witnesses unto me....unto the uttermost part of the earth" (verse 8). For nearly four decades they had preached the gospel throughout the Roma world and beyond. Now, tumultuous events signal a change in world affairs. Signs of the end of the age — given by Jesus in the Olivet prophecy (Matthew 24) — seems to become increasingly evident of the world scene. Rome, with civil war in A.D. 69, appears to be on a fast road to destruction. Wars, moral decay, economic crisis, political turmoil, social upheaval, religious confusion, natural disasters — all these signs are here. The very fabric of Roman society is disintegrating It is a rotten and a degraded world. Surely, Jesus will soon come to correct all that! That the Roman Empire is the fourth "beast" of Daniel's prophecy (Daniel 7) is clear to Christians. With that fourth kingdom in the throes of revolution, God's kingdom surely will come soon! "I will come again." said Jesus (John 14:3). Christians pray, "Thy kingdom come." When Jesus does not return at the height and in the aftermath — of the cataclysmic events of A.D. 66-70, the shock is great. Many Christians are puzzled, disturbed, demoralized. It is a surprising development or nondevelopment. It is a mystery — an enigma. What has "gone wrong"? The apostle Paul had once faced this issue. He had long expected Jesus' return in his own lifetime. In A.D. 50, he had written to the Thessalonians of "we" which are alive and remain unto the coming of the Lord...." (I Thess. 4:15). Five years later, in a letter to the Corinthians, he had written that "we shall not all sleep [died]" before Jesus' coming (I Cor. 15:51). But, in a letter to Timothy in the days just before his death, Paul clearly sees a different picture. He writes of the "last days" in a future context. (II Tim. 3:1-2.) He declares: "I have fought a good fight, I have finished my course...." (4:7). He speaks of receiving his reward at some future time (4:8). Unlike Paul, however, many Christians become disheartened and discouraged. Their hopes are shattered. "Where is the promise of his coming?" many complain. Some Christians — misunderstanding the final verses of the Gospel of John — believe that Jesus will yet return in the apostle John's lifetime (John 21:20-23). As John grows progressively older — outliving his contemporaries — many see support for this view. They still wait for Jesus' return in their generation. They wait. But others are not so patient. They are restless, uneasy. They begin to look for other answers .Their eyes begin to turn from the vision of God's kingdom and the true purpose of life. They lose the true sense of urgency they once had. They begin to stray from the straight path. They become confused — and vulnerable. Until the "disappointment," false teachers had not made significant headway among Christians. Christians expected Jesus' return at any time — they had to be faithful and ready at any moment! Following the martyrdom of many of their faithful leaders, many Christians fall victim to error. Confused and disheartened, they become easy prey for wolves. False teachers are nothing new to the Church. The crisis has been a long time in the making. Paul also warned the Galatians that some were perverting the gospel of Christ, trying to stamp out the preaching of the grue gospel of the kingdom of God that Jesus preached (Gal. 1:6-7). Some departed from the original faith and because of personal vanity, a love of money or because of personal hurts, began to draw disciples away after themselves. Paul had often reminded the churches of the word of Jesus, that MANY would come in his name, proclaiming that Jesus was Christ, yet, deceiving MANY (Matt. 24:4-5, 11). The MANY — not the few — would be lead down the paths of error, deceived by a counterfeit faith masquerading as Christianity. The prophecy now comes to pass. The situation grows increasingly acute. The introduction of false doctrines by clever teachers divides the beleaguered Christian community. It is split into contending factions, rent asunder by heresy and false teachings! Traveling to Rome years later, Simon conspired to sow the seeds of division in the rapidly growing Christian churches of the West. His goal: to gain a personal following for himself. He seized upon the name of Christ as a clock for his teachings, which were a mixture of Babylonian paganism, Judaism and Christianity He appropriated a Christian vocabulary to give a surface appearance to Christianity to his insidious dogmas. By the time of his death, Simon had not fully succeeded in seducing the Christian community at large. But there were those who were attracted to certain of his compromising syncretistic ideas. Slipping unobtrusively into the Church of God, they subtly introduced elements of Simon's teachings. Many fall victim to these false doctrines. Luke, writing the book of Acts in A.D. 62, exposes Simon in an attempt to stem his growing influence. With Simon now exposed, those who had crept into Church fellowship, and who thought in part as he did, disassociate themselves from his name yet continue to promote his errors.. They are no longer known, or recognized as Simonians — but they hold the same doctrine! They assume the outward appearance of being Christians — preaching about the person of Christ — yet deny Christ's message, the gospel of the coming kingdom of God. Also — as Paul had earlier prophesied (Acts 20:29-30) — some even within the Church of God departed from the original faith and because of personal vanity, a love of money or because of personal hurts ,begin to draw disciples away after themselves. Heresies are rife! Sometimes, they are recognized, but often they are disguised and go undetected. Error creeps inn slowly and imperceptibly, gradually undermining the very truths of the Church that Jesus founded. There remains one last obstacle to the complete triumph of heresy — the apostle John. is the last survivor of the original twelve apostles. He works tirelessly to stem the tide of error and apostasy. Writing early in the last quarter of the first century, John declares that "many deceivers are entered into the world" (II John 7). He writes of the many who have already left the fellowship of the Church. ("They went out from us, but they were not of us" — (I John 2:19). He revels that some apostate church leaders are even casting true Christians out of the church! (III John 9-10). In a series of visions, John is carried forward into the future, to the "day of the Lord" — a time when God will supernaturally intervene in world affairs, sending plagues upon the unrighteous and sinning nations of earth. And a time that will climax in the glorious Second Coming of Jesus Christ! The picture laid out in vision to John represents another major shock for the first-century Church. Here are astounding, almost unbelievable revelations! Images of multithreaded beasts, of great armies, of strange new weapons, of devastating plagues and natural disasters! What does it all mean? Some few begin to see the teachings of Jesus in a new light. He had stated in his Olivet prophecy (Matt. 24:22) that "except those [last] days be shortened, there should NO FLESH be saved...." Many had wondered about this statement. They could not understand how there could even be enough swords, spears, and arrows — and men to use them — to even threaten the GLOBAL annihilation of all mankind. Now, John's vision provided an answer. There would one day come a time when never-before-heard-of superweapons — described by John in strange symbolic language — would make total annihilation possible! ONE DAY.....but not now. There will yet come a future crisis over Jerusalem, many also realize. There will come a time when Jerusalem will again compassed with armies (Luke 21:20) trigger a crisis even greater than that of A.D. 66-70. John is released from imprisonment in A.D. 96. IN his remaining days he and faithful disciples strive to keep the Church true to the faith as he was personally instructed in it by Jesus himself.